Very modern and similar to Lakeside Park Drive in Reydon, it's not entirely worth the trip on its own but it does perform the requisite crinkle and crankle, plus it has a decent skirt and topping off. And, fellow parents, it falls within the highly regarded Farlingaye School catchment. Palm tree, too, possibly of interest to Rick Sheepshanks (see Rendlesham Hall). Five minutes walk from Mallard Way is Glebe House, a former rectory designed by one S.S. Teulon in the 1840s. In we go to set the usual scene (tour of CC walls) and ask the usual question (can we see yours). Young uniformed care home lady asks her more senior boss who in turn says she'll need to ask the neighbours since, strictly, it's owned by the people next door. Another lady appears, the owner, and is curious: how did I know about their wall? Oh, and did I know it's a modern one that they built around 2000? Ah, no I did not. I'd assumed it was contemporary with the house. Not so. After buying Glebe House, and inspired by a regular commute past Easton, they decided to build their own, a little like Ashbocking. Pleasingly tall, it weaves and wends and separates their residence from the retirement home. 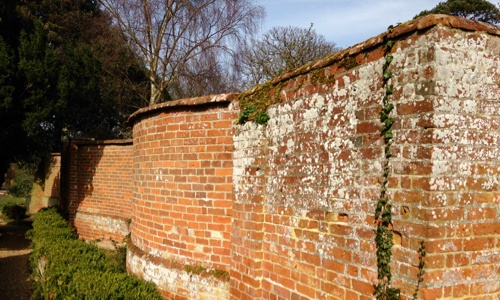 Nearly 20 years of weathering has aged it such that it now blends in well with the original kitchen garden wall towards the rear. If they moved, she adds, they'd build another one! Thanks for the info and kindly showing us around. It crinkles, it crankles, it crinkles, it stops. Norman Stanley Fletcher had a longer stretch. Surely, much like Long Melford, there's nothing more to see in Eye? Ticked off are Chandos Lodge, Buckshorn Lane and Stanley House. Except that the chap who owns Stanley House thought he'd seen a modern wall in a new housing development on the edge of town. On Castleton Way and opposite Harismere School sits the Millfield estate. Round to the right, towards the rear, we find a pair of recent wavy walls. The one which guards a conservatory has a double brick red skirt, the other doesn't. Which is fine. Things don't have to match all the time, you know? I know it has its detractors but, thanks to some fine family holidays back in the '70s, I love Lowestoft. With most of the original Crinkle-Crankle Crew reunited, thanks to the Easter break, what better time to Go East? This Score leads down between distinctive "crinkle crankle" walls. These walls have withstood winds and the passage of time even though they are only a single brick in thickness and are built without buttresses. Despite those fine words, I'm not convinced that much of the original structures remain. 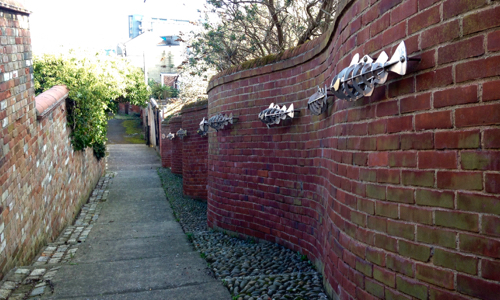 Bits of older crinkle-crankle segments are hanging on at the bottom of the sloped path, while at the top there's a suspiciously new-ish downhill length with metal fish sculptures attached. This way to the sea! Ten minutes south-west of allegedly low-rent Lowestoft is civilised Carlton Colville, home of the East Anglia Transport Museum. Strolling through the sunlit graveyard of St Peter, all eyes are peeled for the Old Rectory. After ten minutes scratching our heads, I caved and knocked on a door for directions. Now, this is worth listing, being tall (around 2m), old (late C18) and lengthy (around 30m). Like a quality embroidery, front and back are both top notch. Running down the lane to the left, clumps of daffodils, etc., enhance the authentically antique outer length, while the inner section (necessarily seen at a distance) has a matching serpentine flower bed and lots of lawn. Lovely scenes in the setting sun of a Good Friday. Late afternoon, away at the in-laws for Easter and in need of some fresh air. 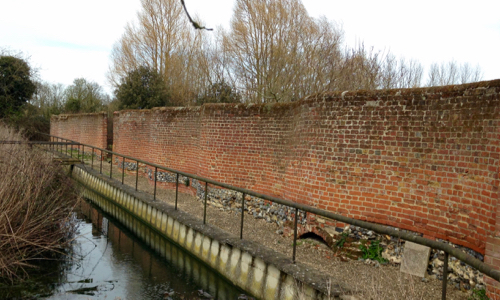 Not far from Stowmarket, close to Woolpit and therefore within easy reach of an unvisited wall. With both daughters in tow, let's go. Before you know it, we're parked outside the church of St Andrew in nearby Tostock. 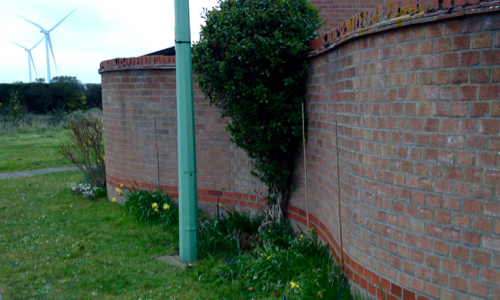 Along the public footpath to the right of the church and there's a driveway with signs to various houses. I don't believe we were intruding -- apologies if we were -- but here's a listed but hidden gem. 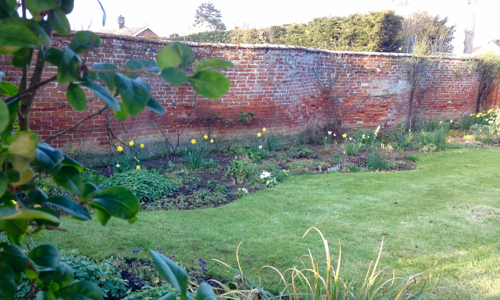 This, folks, is a C19 kitchen garden surrounded by four (count 'em) 2m crinkle-crankle walls. Wow. We didn't go in. That would be overstepping the mark. But we did peer over the gates at either end to admire the trees, bushes and plots within. 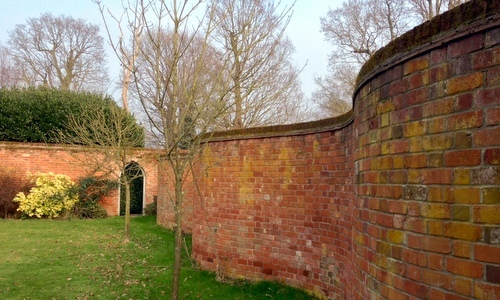 As and when I write my guide to crinkle-crankle walls in Suffolk, this would be the perfect spot for the launch party. Rewinding to mid-Jan's Radio Suffolk appearance, a listener named Wurzel asked if I knew of a crinkle-crankle wall in Dunwich. No, sir, I did not. Later, that same wall was confirmed by its appearance on Dr Bettley's list. Through Middleton and Westleton, right at the fork and right again onto Minsmere Road. Here, on the left, is Cliff House Holiday Park. Looks smart, this place, and there, next to the car park, is our wall. Probably seven feet tall and, curiously, with the odd buttress, it seems to form two sides of an old kitchen garden. There's a gateway too but the view is sadly blocked. However, the Cliff House website has a terrific YouTube promo film shot from a drone on a very sunny day in 2015. About 20 seconds into the film, there's an excellent view of the garden (complete with trampoline and pond) on the far right of the screen. Well worth a look. 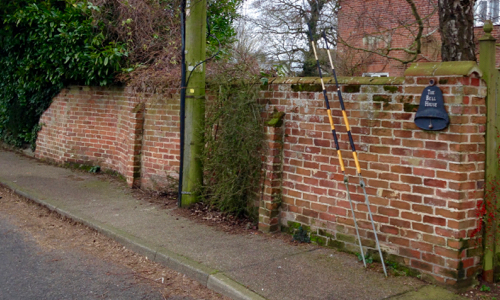 Just to update your search for wavy walls, there was one at Brickwall Farm, Broad Road, Bacton near Stowmarket... the wall was at the back of the farm house and not visible from the road. In all my dealings thus far, Bacton had never featured. Turning up unannounced on Sunday, we were fortunate to be welcomed by current owner Mick, the perfect host. 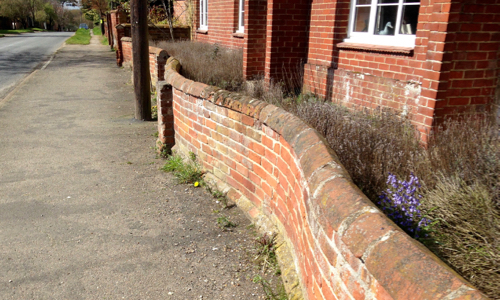 Whereas the wall alongside the road is straight, the parallel wall to the rear is decidedly wavy and looks a treat with its beds of flowers. It's a good length, too, with piers, and includes a locked metal gateway. I own this side, he said, and next door owns the other side. You're welcome to see if they're in. Which they were, the helpful lady inviting us to wander round and admire the view in front of a watery ditch c/w childproofed handrail. Base of the wall, like Palgrave, is flint-covered. 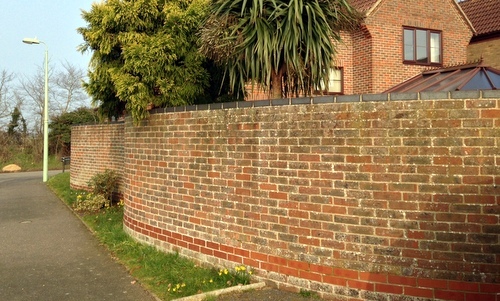 What's curious to me is that there's no mention of this wall in any listing descriptions that I've seen, and nothing at all about it on the web. 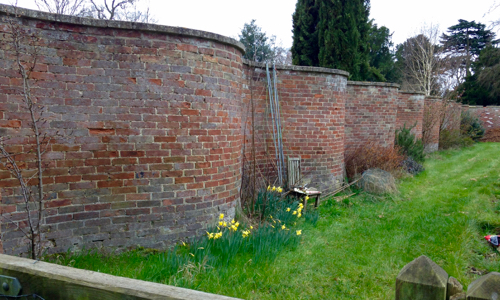 Maybe there are more low-key walls such as this hidden away in people's back gardens? Anyway, hat-tip to Richard for the info. There is a crinkle crankle wall at Redgrave in front of The Red House which used to continue on to the next house although this was not so high. With a brief detour to revisit impressive Palgrave, we passed Cross Keys to find the Red House on The Street. Outside is a dead straight wall which keeps going to the more modern property next door, and here we find the teensiest hint of a crinkle. No crankle, though. One further house along, however, is a two house terrace including Juniper Cottage. Sitting proudly along the full length is a waist-high crinkle-crankle of a similar height to Shotley. T'aint much but it's ticked off.